The HTC Vive is dropping in price for Black Friday and Cyber Monday, making it so you can still be an early adopter of VR gaming but without paying full price. 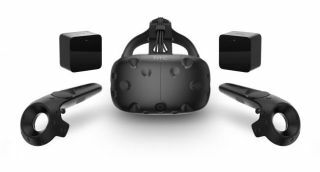 Specifically, HTC says the Vive will be marked down $100 wherever it is sold. That includes Microsoft Stores, Amazon, Gamestop, Newegg, Micro Center, and on the Vive website. Vive will for the first time also find its way to 34 Fry's locations across the U.S. and online. If you need help finding a local vendor, use the store locator to see which retailer is closest. The VR headset won't be the only thing on sale. HTC promises "big discounts" through its Viveport app store, along with a cash back offer and a bundle deal. "For the entire holiday weekend, Viveport, HTC Vive’s app store for all non-gaming VR content, is offering big savings for customers around the world. Customers who spend $30 USD equivalent or more between Black Friday and Cyber Monday get $10 USD equivalent back in their wallets. You can also build your library with a $5 bundle deal on three of the most popular VR apps: Soundstage, Arcade Artist, and Lumen," HTC says. The holiday weekend sale kicks off at 11:59 PM Pacific on November 24 and goes until 11:59 PM Pacific on November 29. If you haven't already, be sure to bookmark and check often our list of the best Black Friday PC gaming deals. We'll be continually updating it throughout this week and next.